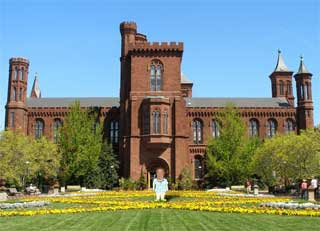 That was the stated reason for the monetary gift that created the Smithsonian Institution in 1835. Today it is the largest museum complex in the world, consisting of over nineteen museums, a zoo, and nine research centers. It's based mostly in Washington, DC -- from where I am writing to you today -- and it almost never happened. A very wealthy British scientist named James Smithson decided that if his lone heir, a nephew, did not have any children, he would leave a sum of $10 million dollars (in today's money) to the government of the United States to create just such a museum. Talk about pressure! Well the kid didn't produce and the money went west, even though Smithson himself had never even been to the US and didn't know anyone here. After President Jackson announced the gift to Congress, the money was promptly invested and lost on state bonds that defaulted. But feeling badly about about such a blunder, the Congress authorized repaying the gift (with interest) a some years later, and construction began in 1844. Now there are over 135 million objects in the museum's collection, of which only a small percentage are on display at one time. Among its most iconic items are Dorothy's ruby red slippers worn by Judy Garland in the Wizard of Oz, Neil Armstrong's spacesuit, the Wright Brother's Flyer, the Hope Diamond, and the flag that flew over the bombardment at Fort McHenry, inspiring Francis Scott Key to pen "The Star Spangled Banner". But there are plenty of lesser known gems to uncover. Ever heard of Soap Man? A fellow named Wilhelm von Ellenbogen, who died of yellow fever in the 1790's, had his corpse go through a rare, but natural, process whereupon all his body fat was converted to soap, mummifying him in great detail. His wife, Soap Lady, was buried in the same spot and her remains now reside in Philadelphia. Or how about Naked George Washington? It was the first statue ever commissioned by Congress, and created by Horatio Greenough in 1841. But when it was delivered, it drew snickers instead of praise. You see, he has Washington in a classic Greek pose of Zeus - naked to his waist, with a toga tastefully draped over his man parts. They tried moving it to less conspicuous places in the Capital, but it continued to draw laughs until it ended up here. While visiting DC, I am staying at a timeshare rental at Wyndham Old Town Alexandria in nearby Alexandria, VA. It features an indoor pool, exercise area, guest dining area, and is walkable to the Metro system for easily moving around the area. Be sure to leave some time to explore Old Town Alexandria too, with its lively nightlife and quaint shops and restaurants. Looks like you can get a 2 bed/2 bath unit, with a full kitchen, for about $150/night on RedWeek. Our members give it 4.5 stars, and I'd have to agree with them. Well, I am heading back to "America's attic" as the Smithsonian is sometimes called. I just love presidential memorabilia, and they have some of the best. I am not too interested in naked George, but I would like to see some of his hair. That's right, they have locks of hair from the first 14 presidents. I am not sure why they stopped with Buchanan, but if its anything like having kids, you run out of places to put the stuff if you hold onto every little thing.